The Duke and Duchess of Cambridge have adamantly shielded their children from the unrelenting glare of the public eye in the hope that they might live a normal childhood, which I can wholeheartedly respect. It is for precisely this reason that I refuse to publish paparazzi photos of Prince George and Princess Charlotte on my blog. However, the official pictures released by Kensington Palace-and often taken by mum Kate herself- have offered brief glimpses into the lives of the Cambridges. From these photos and from tidbits of information that William and Kate have given to the public one can gather some sense of what life must be like growing up a royal child. I personally love to look at baby and children’s toys because I think they are sweet. I also think it is fun to imagine the types of toys and accessories that may be found in the royal nursery at Anmer Hall. So here is a fun little blog discussing George and Charlotte’s favorite things for those of you lucky enough to have children in your life to shop for! In one of the sweet pictures that Kate took of Charlotte when she was about six months old Charlotte can be seen holding a Jellycat “Fuddle Wuddle” puppy, which happens to be one of her favorite toys. I love her toothless smile as she looks at her puppy with glee! The same exact puppy may no longer be available but there are some similar ones that babies would love just as much. Jellycat is an English company and their stuffed animals are very soft and meant to be appropriate for children of all ages including very small babies like Charlotte. Here is a brown puppy very similar to Charlotte’s. Jellycat also produces sweet baby books that are meant as companion pieces to the stuffed animals. One of the stuffed toys plus a matching book would make a really sweet baby shower gift. And here is the adorable matching stuffed animal! Too cute. And another matching book! I wonder if Charlotte has some of the books to match her stuffed dog? Besides dogs, Jellycat also makes some other adorable animals. There are too many for me to list all of them here so I will just pick some of my favorites. I love this stuffed bunny with the cute contrasting pattern on the ears and paws. Perfect for a little girl. I also have a soft spot for giraffes. I just love the pattern. And what little girl doesn’t love unicorns? And look! It has a matching book, too! 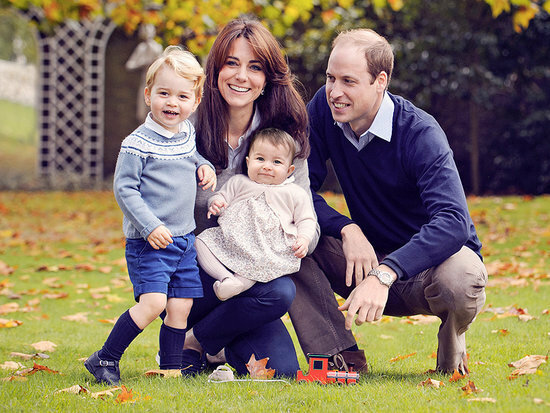 For their Christmas photoshoot, the Cambridges posed outside. We can see that Prince George was playing with a wooden toy train on the ground near Prince William’s foot. The train is by Orange Tree Toys, an English toy company that specializes in classic wooden toys. George’s toy train is currently sold out yet I have found some other toys by the company that are very sweet and I wouldn’t be surprised if they might be in the children’s nursery. First, there is this really cute dog push along that I can imagine George and Charlotte playing with. It’s made by the same company that made George’s train and is colorful yet classic. They also have this cute wooden Noah’s Ark set. Since Kate seems to like to buy George and Charlotte wooden toys, I would also like to point out that one of my favorite American toys companies, Melissa and Doug, also makes some really sweet classic wooden toys. For example, since George’s exact toy train is sold out, take a look at these wooden Melissa and Doug trains which are similar in style. For her adorable 1st birthday shoot, Princess Charlotte showed off her walking skills with a Orange Tree Toy block push toy. Like the train that George was pictured playing with, this toy also sold out quickly. But here is a similar block pull toy by Melissa and Doug. And Melissa and Doug also make a few cute wooden push toys that are meant to help encourage toddlers beginning to walk. Back when Kate was pregnant with George a few years ago, she was seen out and about with her mom, Carole, purchasing some baby items at boutiques. This Moses basket sticks out in my mind when thinking about what items might be in George and Charlotte’s nursery. I bet that both babies used this basket. And while Kate purchased a Moses basket from a more exclusive and expensive boutique, I managed to find a pretty one from Kohl’s for a reasonable price.